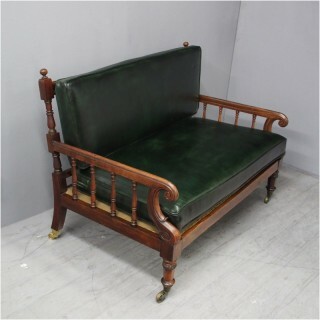 Circa 1825, George IV solid rosewood two seater sofa with two removable cushions recently upholstered in hand dyed green leather with piped fore-edges. 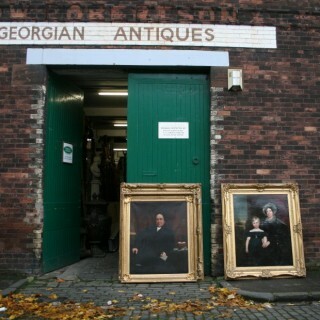 To the back of the sofa are two turned uprights finished with finials and the top rail has various shaped double ogee mouldings above 10 turned uprights or balusters held in place by a bar beneath. Half way down the upright there is a simple turned arm with a rounded top and finishing with a curl at the end, held in place by further turned uprights. The front of the arms have a very stylish shaped return with a carving on the front and on the sides. The back legs are slightly out swept and finish with a brass cup and brass castor. The front legs are simply turned with a carved top section then a tapering chamfered section and finishing on brass castors. Size 90 cm high x 121 cm wide x 79 cm deep.